CD-Rom version of the popular 2-player game has AI players designed by Klaus Teuber with whom you play the Base Game, and the ability to play online for free with cards you select from the Expansion Sets (including a set of 10 cards not included in Mayfair versions) in an online tournament. Includes the 10 card mini expansion Die Turnierkarten T2002 as physical copy. An English converter is available here at boardgamegeek. 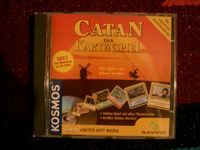 Though nominally outside the scope of BGG, this remains here because of relationship with the Catan franchise.